If you are like many family caregivers, one of the elements of the holiday season that you look forward to the most is getting to spend quality time with your senior. This is particularly true if you are a distance caregiver who does not have the opportunity to spend as much time with your loved one as you would like. Your holiday season visits are a chance for you to reconnect with your senior and spend more time with them, as well as check in on them and ensure that they are still doing well as they age in place. Take some time during your visit to check areas of their home to identify any risks or indications that they might be struggling with challenges and issues. One area of the home that is particularly important to check is your parent’s bathroom. Simply by its nature, this room tends to be more dangerous than others and can be a strong indication of how your parent is doing. • Loose towel rod. Take a look at your parent’s wall-mounted towel rod and give it a wiggle. If the towels look disheveled and it feels loose, it could be an indication that your elderly parent has been using it for physical support when navigating the room. This is not only a sign of potential challenges, but also a danger. Towel rods are not designed to withstand such weight, and it could simply collapse, causing your loved one to suffer a serious fall. • Soap scum buildup in the shower. If your parent has always been neat and clean and you notice that their shower is not clean, it could be an indication of serious issues. They could be suffering from cognitive functioning decline that prevents them from cleaning up the home, or mental health issues that minimize their motivation. They could also be suffering from physical limitations that prevent them from being able to handle the actual task of cleaning. • Issues with brushing their teeth. Visit your aging parent while they are brushing their teeth and pay attention to how they are doing it and their response. If they are brushing gingerly, avoiding flossing, or you notice even a little bit of blood in the sink, it could be an indication of dental health problems that could put the well-being of their entire body at serious risk. If you have noticed that your aging parent is dealing with challenges, limitations, and other issues that threaten their safety and well-being as they age in place, now may be the ideal time for you to consider starting home care services for them. An in-home senior care services provider can be with your parent on a customized schedule tailored for their individual needs, challenges, and limitations, but also for their personality, lifestyle, and goals. This means that they can enjoy a more active, engaged, and fulfilling quality of life while also staying safe and healthy. As their family caregiver, knowing that there is a home care provider with your parent can give you confidence that they are always getting the care, assistance, and support that they need whether you are able to be with them regularly or if you live at a distance and are not able to visit with them frequently. 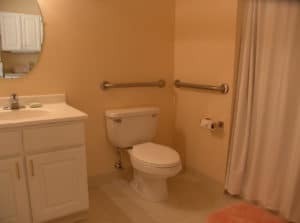 When it comes to helping your aging loved one stay safe and healthy in the bathroom, this care provider can evaluate your loved one’s needs, provide physical support and assistance, and help guide them in keeping the room clean and neat to reduce risk. If you or an aging loved one are considering Home Care Services in Pompano Beach FL to provide companionship, compassion and motivation, please contact the caring staff at Responsive Home Care. Call today 954-486-6440. If you’re experiencing guilt because you’re a long-distance family caregiver, you need to deal with it as quickly as possible. Guilt can get in the way of caregiving and make it more difficult than it has to be. Before you work your way through the guilt, it helps if you can put your finger on why exactly you’re feeling so guilty. Is it because you’re not able to be there as often as you want to be or is it because someone else is telling you that you’re not doing what you should be doing? You can also feel guilty because you know that eventually something serious could happen to your elderly loved one. Once you determine exactly why you’re feeling the guilt, you can take steps to resolve the issue. In some cases, you may not be able to make any changes. If that’s the situation you’re in, you’ll have to come to terms with that in order to resolve the guilty feelings. You may not be able to be there more often, but you may be able to make arrangements with other family members to visit your loved one more often or you may be able to hire elderly care providers. Look at what you can actually do that is concrete and helpful. Guilt can make people shut down and stop communicating with each other and that only makes the situation worse. Whether your loved one is making you feel guilty or you’re feeling guilty on your own, don’t avoid communicating with your loved one or anyone else involved in the situation. If you can work together, you can come up with a solution that works for everyone. Another problem with guilt is that it can make people agree to solutions that they don’t want to agree to. You might bend to pressure that you feel due to guilt that causes you to make a decision that you regret. Follow that path too often and you’ll eventually come to a decision that is a make or break decision and you don’t want guilt in charge there. Guilt can be a powerful emotion because it forces you to really look at the situation. If you can make changes to your circumstances, do it. If you can’t, there’s no reason to beat yourself up. If you or an aging loved one are considering Caregiver Services in Lauderhill FL to provide companionship, compassion and motivation, please contact the caring staff at Responsive Home Care. Call today 954-486-6440. Would Your Parent Benefit from Live-In Care? Starting elderly home care for your aging parent can be an exceptional way to boost the benefits of the care that you already give them, fill any care gaps that might exist in what you are able to offer them, and ensure that your parent can live the lifestyle that they desire and deserve as they age in place. In order for your senior to get the most out of this care, you must ensure that you select the right type of home care for them. There are several different types of elderlyhome care arrangements available and choosing the right one is important to fulfilling their individual needs and challenges in the way that works for them. If you have heard the term “live-in care” you might be wondering if this type of care is the right option for them. Despite how it sounds, this care arrangement does not mean that a care provider actually moves in with your parent. Instead, two or three care providers serve in 24-hour shifts so that your parent is never alone in their home. This care provider cares for your parent during the day and then has the expectation of a full night of sleep. Evaluating the details of this type of care can help you to determine if live-in care would benefit your parent and if it is the right option for them. • Ongoing support. Live-in care includes an elderly home care services provider being in the home with your senior 24 hours a day. This means that they always have access to support when they need it. • Companionship. Having a care provider in the home with your parent at all times does not necessarily mean that they need extensive physical care and assistance. This may be the ideal arrangement for a senior who experiences loneliness, isolation, depression, or anxiety. The companionship can mean that your parent feels more engaged and involved, and that they can be more secure. • Emergency care. The intention of live-in care is not that the care provider is there to give your parent direct care and assistance during the night every night. Instead, this care provider has the expectation of a full night of sleep every night as well as personal time during the morning and evening. If there is an urgent situation, however, the care provider is there to help your parent in the way that they need. For example, if your parent is ill and needs care in the middle of the night or requires some additional support, the care provider is there to help them. • Smoother transitions. Moving into a new home, going home after an extended time in the hospital, or coping with major changes in life such as a death or a new diagnosis can be stressful and difficult for your loved one. Having a care provider with them 24 hours a day, even when some of those hours are spent with the care provider asleep or in personal time, can make your parent feel more secure and help them through this transition. https://www.responsive-homecare.com/wp-content/uploads/2016/10/bigstock-Home-Help-Sharing-Cup-Of-Tea-W-92381972.jpg 200 300 Debbie Savage, RN, BSN, President https://www.responsive-homecare.com/wp-content/uploads/2019/03/rhc-logo.png Debbie Savage, RN, BSN, President2016-10-11 14:52:542019-03-20 10:21:15Would Your Parent Benefit from Live-In Care? How Should You Respond to Offers of Help with Food for Your Elderly Loved One? When you’re already as busy as you can be, planning and cooking your loved one’s meals can seem like an impossible task. So if people are offering to help with that part of your duties, let them. Many times you might not be sure how or when to have people over who want to visit your elderly loved one. Try combining the visit with a meal, which helps you to solve two situations at once. When you let them know to bring dinner, or even part of dinner over, you’re able to worry a little less about at least part of the meal and also know that your loved one is going to have some visitors. When you do accept offers of help with food for your loved one, make sure that the people making the meals know about any dietary restrictions that your loved one has. You can also make a generic list that you can pre-emptively send to everyone who might offer to help with food. This ensures that everyone has the details that they need to be able to make a meal that fits your loved one’s diet. Another option is to ask friends, neighbors, and other family members to bring back a few things when they go to the grocery store. If they’ll already be there, they won’t be going out of their way and you can get the items you need without having to leave your loved one to do it. With time, this might even become a regular habit for the people who care about you. A strange little law kicks into effect at some points in your life and dealing with offers of help is one of those times. The more that you decline help with your loved one’s meals, the less help you’ll get over time. This is because people offer because they genuinely want to help. By continually declining that help, you reduce the likelihood that they’ll continue to offer. Talk to your family members and to your loved one’s homecare providers about the best ways to help ensure your elderly loved one gets the nutrition that she needs. If you or an aging loved one are considering Homecare Services in Pembroke Pines FL to provide companionship, compassion and motivation, please contact the caring staff at Responsive Home Care. 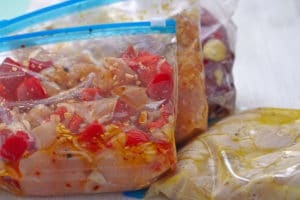 Call today 954-486-6440.
https://www.responsive-homecare.com/wp-content/uploads/2016/10/bigstock-Chicken-Crockpot-Freezer-Meals-81222956.jpg 200 300 Debbie Savage, RN, BSN, President https://www.responsive-homecare.com/wp-content/uploads/2019/03/rhc-logo.png Debbie Savage, RN, BSN, President2016-10-04 15:29:112019-03-20 10:22:05How Should You Respond to Offers of Help with Food for Your Elderly Loved One? How Can You Take Time Away from Caregiving, Even for an Afternoon? The idea of taking an afternoon away can seem impossible for many family caregivers. But the truth is that you really can do just that if you have a system for getting extra help in place. Your mind and your body communicate with you more than you might realize. Your mind starts to have difficulty concentrating, for example, when it needs time to reset itself. Your body might become run down, first displaying fatigue and then possibly moving on to other issues, such as headaches or mild illnesses. These are the later stages, though, when your mind and body are trying their hardest to get your attention. You need to learn what the signs are when you’re not at your limits, but simply nearing them. Everyone does favors for friends and other loved ones from time to time. As a family caregiver, sometimes you might feel loathe to ask other people for help, though. Try to look at it as exchanging help with one person that you’re likely to help later on. When you look at it as something that you can repay, it might be easier to allow yourself to accept help now. Often family caregivers feel that there isn’t anyone who can really help them. The truth is usually quite different, though. There are likely friends, family members, and elder care providers who can offer different levels of help in all sorts of situations. Start by making a list of all the people you can call on for help and then include information about specific tasks that each person could help you with. When people do offer you help, take them up on the offer. Unless the situation is completely not helpful for you or your elderly loved one, you can definitely take advantage of unexpected offers of assistance. If you’re still at the point where you’re learning your limitations, these types of offers can even help you to spot cues that you might have otherwise overlooked. When you do finally have some time to yourself, use it to get back on target and to recharge yourself. https://www.responsive-homecare.com/wp-content/uploads/2016/09/bigstock-Senior-woman-with-eyeglasses-i-53566387.jpg 300 229 Debbie Savage, RN, BSN, President https://www.responsive-homecare.com/wp-content/uploads/2019/03/rhc-logo.png Debbie Savage, RN, BSN, President2016-09-27 16:31:482019-03-20 10:23:00How Can You Take Time Away from Caregiving, Even for an Afternoon? When Should You Be Concerned about a Fever? As a family caregiver one of your primary focuses in life is making sure that your senior parent stays as healthy as possible. While pursuing this goal it is easy for you to feel concerned and overwhelmed when you notice certain symptoms. By understanding these symptoms you can better know how to respond to ensure that they get the care, treatment, and support necessary to keep them healthy. One of the symptoms that may cause the most concern is a fever. When your parent starts to exhibit an elevated temperature, you might immediately think that they are dealing with something serious. Taking a step back and thoroughly evaluating their condition, however, can help you to ensure that you are not overreacting and are giving your parent the attention that they actually need. A fever is when your body’s temperature increases as a reaction to something that is going on within the body. This can be slight or severe depending on the situation. Though uncomfortable, a fever in an senior adult is generally not a serious issue unless it has reached 103 degrees or higher. Fevers rarely last more than 48 hours, and tend to respond quickly to remediation tactics such as your parent taking over-the-counter fever reduction medications or using a cool compress to bring the body temperature down. It is extremely important to remember that if your parent is suffering a medical condition, has a compromised immune system, or is otherwise vulnerable, a fever could be a more serious situation. If your parent is showing signs of a fever, particularly in conjunction with other symptoms such as a sore throat or vomiting, you should get in contact with their doctor as soon as possible to get them an accurate diagnosis. This will help to prevent potentially serious consequences. Senior care can be extremely beneficial if your elderly parent has been suffering from illness or infection. Having a senior home care services provider in the home with your aging parent helps them to follow through with the guidelines set forth by their doctor to help them recover from their current condition, as well as stay healthier as they age in place. 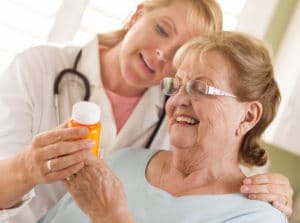 A personalized approach to care and assistance can include offering reminders to take their medications when they need to, assisting with grocery shopping and meal preparation to encourage a healthier, more varied diet, and supporting both activity and enough rest to keep their body strong, healthy, and resilient. This can be especially reassuring for you as you know that your elderly loved one is in good hands whether you are able to be with them or not, allowing you to take care of the other obligations in your life with lower stress and worry. If you or an aging loved one are considering Senior Care Services in Sunrise FL to provide companionship, compassion and motivation, please contact the caring staff at Responsive Home Care. Call today 954-486-6440.
https://www.responsive-homecare.com/wp-content/uploads/2016/09/bigstock-Happy-Female-Doctor-or-Nurse-E-44058340.jpg 223 300 Debbie Savage, RN, BSN, President https://www.responsive-homecare.com/wp-content/uploads/2019/03/rhc-logo.png Debbie Savage, RN, BSN, President2016-09-20 16:16:352019-03-20 10:24:11When Should You Be Concerned about a Fever? Is Your Loved One Experiencing Hearing Problems? Hearing loss is a sudden or gradual decrease in how well a person can hear. It is one of the most common conditions affecting older and elderly adults, according to the National Institute on Deafness and Other Communication Disorders. So common is the problem, that the Institute says approximately one in three people between the ages of 65 and 74 has hearing loss and nearly half of those older than 75 have difficulty hearing. Having trouble hearing is not just embarrassing or troublesome in dealing with family or friends. It can also be dangerous if a person can’t properly understand doctor’s orders, hear doorbells or alarms, hear emergency vehicles when driving, or respond to other warnings. But how do you know if the person for whom you’re a family caregiver is suffering from a hearing loss—especially if it’s gradual? Hearing loss increases with age, but because it can’t be seen it is usually detected in behavioral changes. Perhaps your elderly loved one is asking you or someone else to repeat themselves more frequently, or they’re complaining that people are mumbling or not speaking clearly. Is the TV or radio volume louder than usual? These are definitely strong indicators that something might be changing with their hearing. They are having trouble hearing while on the phone. They are having trouble following a conversation where two or more people may be talking at the same time. They are struggling to hear a conversation. They are having trouble hearing in places where there is a lot of background noise, such as a restaurant or other public places. They are complaining about having pain or ringing in their ears; or they’re experiencing dizziness. They are misunderstanding what people are saying or answering in a way not related to a question or comment. They are having difficulty understanding when women or children talk. Their personality is changing in that they normally are very social, but now doesn’t want to spend time socially or around groups of people. Because behaviors change when hearing loss is present, it is sometimes mistaken for dementia. If left untreated hearing loss can lead not only to total deafness, but damage in parts of the brain related to hearing. When the nerves in the brain don’t get signal related to hearing, they stop working; much like muscles that atrophy if they’re not used. If you notice changes in your elderly loved one’s behavior or suspect they’re having trouble hearing, they should be seen by their doctor. Their physician can rule out any other possible causes and, if necessary, give you a referral to a hearing specialist. If you or an aging loved one are considering Elderly Care Services in Tamarac FL to provide companionship, compassion and motivation, please contact the caring staff at Responsive Home Care. Call today 954-486-6440.
https://www.responsive-homecare.com/wp-content/uploads/2016/07/bigstock-Doctor-Fitting-Senior-Female-P-78517418.jpg 200 300 Debbie Savage, RN, BSN, President https://www.responsive-homecare.com/wp-content/uploads/2019/03/rhc-logo.png Debbie Savage, RN, BSN, President2016-09-14 12:44:332019-03-20 10:25:32Is Your Loved One Experiencing Hearing Problems? Most of us don’t even think about swallowing, but for someone with dysphagia (difficulty during swallowing), eating and drinking can be scary. If you or a loved one has been diagnosed with dysphagia, the risk of aspiration (breathing in a foreign object, i.e. sucking food or liquid into the airway) is present each time you eat or drink. Responsive Home Care caregivers attended a training this month on aspiration prevention and awareness. 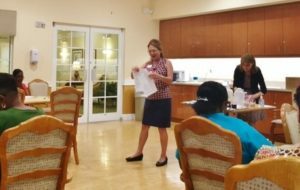 Topics included the causes, signs, and symptoms of swallowing problems, the complications that can arise if a client has been diagnosed with dysphagia, and the dangers of aspiration and aspiration pneumonia. We also reviewed silent aspiration and what the caregivers should watch for and who and when to alert if they see symptoms. Representatives from Simply Thick spoke to our caregivers about their product, and gave some product demonstrations. Simply Thick is the only gel thickener on the market, and can be added to cold and hot beverages, soups, cocktails, carbonated beverages, and treats like ice cream and jello. Unlike other powder thickeners, Simply Thick completely mixes in seconds (5 second if shaken, 20 seconds if whisked), and stays stable as long as the product in which it’s mixed remains unexpired. It can even be mixed with water and frozen to make safe ice cubes! If you are interested in trying this innovative product, please let us know! If you or an aging loved one are considering Caregiver Services in Coral Springs FL to provide companionship, compassion and motivation, please contact the caring staff at Responsive Home Care. Call today 954-486-6440.
https://www.responsive-homecare.com/wp-content/uploads/2016/09/responsive-pic916.jpg 200 317 Debbie Savage, RN, BSN, President https://www.responsive-homecare.com/wp-content/uploads/2019/03/rhc-logo.png Debbie Savage, RN, BSN, President2016-09-12 19:09:262019-03-20 11:31:31Swallowing trouble? 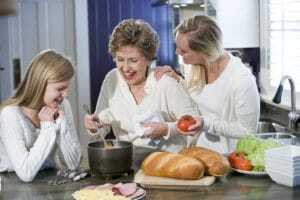 How Can You Allow Friends and Family to Help You with Meals for Your Loved One? For some family caregivers, it can be difficult to know how and when to allow friends and family members to help out with making meals. On the one hand, it feels like an imposition, but on the other hand, it can save so much time for a busy family caregiver. Resolving the internal conflict can be all in how you approach the issue. If you don’t let your friends and family know that you could use a little bit of help with meals, then they’re not likely to offer very often. On the other hand, if you are more open with your friends and family members, you may even be able to set up a schedule where people take turns providing meals for your senior loved one’s freezer. When you do have a system in place for other people to help out with meals, it’s extremely important that you let them know about any dietary concerns that your loved one has. If your loved one needs to cut back on salt or high fat foods, for example, be sure to mention all of that. If there are specific ingredients you’re trying to incorporate more often, let them know that, too. It’s entirely possible that over time, you’ve collected some recipes that your senior loved one really enjoys. But if you don’t even have time to make them, those recipes go unused. Try sharing them with some of the people who have offered to make meals for your loved one. That way your loved one gets to try favorite recipes made with love, even if you weren’t able to do it yourself. You’ll keep getting help from friends and family members if you let them know how much they’re helping you. You don’t have to do anything elaborate, either. Simply call the person who dropped off a meal and let her know exactly how much that one act helped you or your loved one. If you have a few more minutes, try writing out a quick thank you note. It’ll be appreciated. Make sure you keep reheating instructions so that anyone from other family members to your loved one’s senior care providers can reheat meals for your loved one. If you or an aging loved one are considering Senior Care Services in Plantation FL to provide companionship, compassion and motivation, please contact the caring staff at Responsive Home Health. Call today 954-486-6440.
https://www.responsive-homecare.com/wp-content/uploads/2016/08/bigstock-Grandmother-With-Family-Cookin-7854236.jpg 200 300 Debbie Savage, RN, BSN, President https://www.responsive-homecare.com/wp-content/uploads/2019/03/rhc-logo.png Debbie Savage, RN, BSN, President2016-08-24 14:35:222019-03-20 11:37:12How Can You Allow Friends and Family to Help You with Meals for Your Loved One? Choosing an elder care provider for your aging parent can be one of the most important things that you do for them. When you are going through this process, you want to make sure that you have selected the care provider who will be best for your aging parent both in terms of the care that they give, and their compatibility with your loved one. As you are having conversations with them, consider asking these questions. When they answer, do not just pay attention to what they are saying. Instead, listen to the words that they choose, how they say them, and their personality and attitude as they are talking. This can show you the real person behind the answers and help you to better determine which potential care provider is the one who will give your parent the quality of care that they deserve. • Why did you decide to go into the elder care industry? Everyone has a reason for taking the career path that they choose, and when it comes to an elderly home care services provider who may care for your aging loved one, you want to know why they chose to do what they do. There are many different reasons that people choose this path, so listen to their story and determine if their motivations go along with what you hope for for your aging parent. • How much experience do you have? 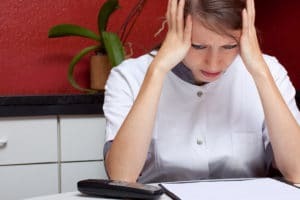 This is an expected question any time a person is starting a new job or position, but do not limit it just to how long they have worked for the particular company or how long they have been a professional care provider. Instead, let them tell you about real life applications of the skills and emotional considerations of being a care provider and use this to determine their true applicable experience. • What do you consider the most challenging aspect of being a care provider? No matter how much someone enjoys their job, there are always challenges and difficulties to every position. Having the care provider tell you what they consider the most difficult for them can give you great insight into their personality and their care approach. • What do you consider the most rewarding aspect of being a care provider? Another great opportunity for you to gauge this care provider’s personality is asking them what they really enjoy about being a care provider. This can help you to really see what type of person this care provider is, their attitude, and the type of care that they provide to their elderly clients. • What else do you think I should know? While this seems like a simple and straightforward question, it can actually be one of the most challenging for this person to answer. This gives them the chance to tell you about themselves as an individual rather than just as a professional care provider. Take what they say and evaluate how these details might impact your parent’s care. For example, if this care provider has several children you might consider if that could impact their availability. If you or an aging loved one are considering Elder Care Services in Lauderhill FL to provide companionship, compassion and motivation, please contact the caring staff at Responsive Home Health. Call today 954-486-6440. Pictured above: Responsive team members from the marketing, staffing, HR, and nursing departments: Stephanie, Maydene, Mary, Kisha, Pauline, and Genevieve. Last month, Responsive Home Care staff members had a great time in Hollywood at the Social Room, and raised money for the Alzheimer’s Association of Broward County! 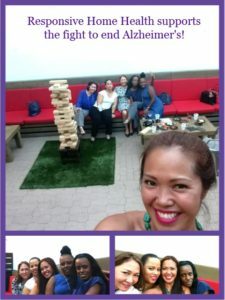 Fun was had by all, playing giant Jenga (pictured in top picture), giant checkers, and enjoying some of the Social Room’s famous cocktails. Please join us in walking on Saturday, October 22nd, 2016, or donate to our Responsive Moves team online. If you or an aging loved one are considering Homecare Services in Pompano Beach FL to provide companionship, compassion and motivation, please contact the caring staff at Responsive Home Care. Call today 954-486-6440. Even with all of the benefits that total hip replacement surgery can offer to your aging loved one, it can still be nerve racking to prepare for the procedure. By giving your parent as much information as you possibly can about the procedure and what to expect after it, you can help your elderly loved one feel more at ease and confident, as well as give yourself greater peace of mind. Duration. The surgery itself will only take about 1 to 2 hours. During this time you can wait for your parent in the surgical waiting room where the medical team will let you know when the surgery is complete. Immediately following the procedure your parent will stay in the surgical room for another hour or two for monitoring before being moved to their hospital room. Lack of movement. Your parent can be expected to be on restricted movement for several hours following the procedure. This is to give the body the chance to begin the healing process on the joint itself as well as the surgical site. They will be in a bed that is designed to support the joint in a specific position and that can be adjusted to help them stay comfortable and manage tasks such as eating. Sutures. The surgical site will be closed using stitches or staples. These will likely be removed around two weeks after the surgery. Until they are removed it is extremely important that you follow care guidelines offered by the doctor, including not getting the area wet. Length of stay. Depending on their age, condition, health, and any complications that might have arisen during the surgery, your aging parent can expect to remain in the hospital for 3 to 5 days following their surgery. After this the doctor may recommend transferring into a rehabilitation center or going directly home to continue recovering and rehabilitating there. The full recovery period can be 6 months or more. 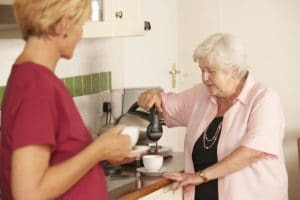 Having an elderly home care services provider in the home with your parent throughout the recovery period is one of the best ways to ensure that they will get the care, support, and assistance necessary to guide them through the recovery process and ensure that they can heal in the best way possible. This includes managing basic tasks such as meal preparation, light housekeeping, light laundry, and errands so that your parent can get the rest that they need to heal, as well as encouragement to get active when it is right for them. A home care provider can also offer valuable companionship and emotional support that will help your parent to get through the potentially difficult period of recovery in a way that is healthy and beneficial. If possible, get this home care provider into place prior to the surgery. This will not only ensure that they are there for your parent from the very beginning of their recovery period, but it will also afford your parent the opportunity to get accustomed to the care provider. By feeling more comfortable with the elderly home care services provider before the surgery your parent will be prepared to accept care and assistance from them after the surgery, helping to reduce the chances of complications and improve overall results. If you or an aging loved one are considering Home Care Services in Pembroke Pines FL to provide companionship, compassion and motivation, please contact the caring staff at Responsive Home Health. Call today 954-486-6440.